A former Chairman of the Economic and Financial Crimes Commission, EFCC, Nuhu Ribadu, and a former presidential adviser, Ahmed Gulak, have lambasted the Adamawa State Acting Governor, Ahmadu Fintiri, for seeking to contest the state’s October 11 governorship bye-election. 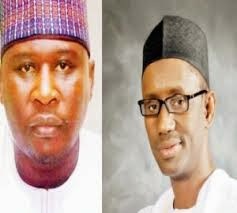 Messrs Ribadu and Gulak, both of them candidates for the election, said Mr. Fintiri lacks the “moral” standing to replace a governor whose impeachment he personally steered. The race to elect former governor, Murtala Nyako’s successor promises to be keen with a number of prominent figures vying to clinch the ticket of the Peoples Democratic Party, PDP for the election. Mr. Ribadu defected from the All Progressives Congress, APC, a week ago to join the PDP, which also has Mr. Gulak, Mr. Fintiri, Buba Marwa, a former Lagos State governor, and others. As Speaker of the State House of Assembly, Mr. Fintiri was in the lead for the removal of Mr. Nyako, whom state lawmakers accused of financial abuse. The assembly also ensured Mr. Nyako’s deputy resigned, paving the way for Mr. Fintiri to take over as the acting governor. The acting governor has come under intense criticism after declaring to vie for the top job, with many accusing him of moving against the impeached governor for personal benefit. Mr. Gulak who spoke with reporters at his Yola residence, said the nation’s constitution is clear and the spirit and letters of the constitution is clearly spelt on whether or not Mr. Fintiri should contest. “First and foremost, Fintiri should know he is the speaker of Adamawa House of Assembly. 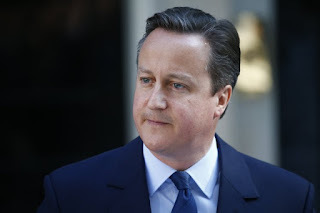 It’s by that virtue of the post, that he is the Acting Governor as there was no Governor and Deputy,” Mr. Gulak said. “His position as speaker is reserved for him, meaning that he should midwife this election, after that he should resume his post as speaker. He has no moral basis to contest, that’s not the intention of the framers of the constitution, and it has not encourage members to do so. “The Constitution is clear. He is not supposed to contest this bye- election. Because apart from the letters of the constitution by implication, he is suppose not to participate as he has no moral right. 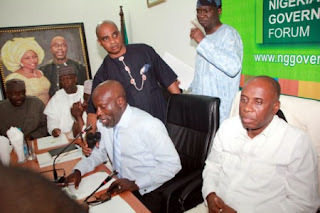 “If he want to contest, he should better resign to avoid inviting calamity,’’ Mr. Gulak noted. Mr. Gulak advised the PDP against manipulating the constitution saying it would portend danger for Nigeria’s democracy. “If it happens like this, members of the state house of assembly will just sit down and impeach the governor and his deputy, just to clinch into power, and that is not the intention of the framer of this constitution it is an impeccable fact that the constitution has reserved his seat as speaker that is why the deputy speaker is acting and it by the virtue of his position as a speaker that he is acting governor,” he said. Also reacting, Ribadu’s campaign office in Yola observed that “The acting governor has no moral justification to contest the polls; he ought to act as an impartial umpire to monitor and conduct a free and fair election”. Mr. Ribadu said the aspiration of the acting governor was a clear move to use his advantaged position over other candidates adding “Fintiri is desperate; many thought that he will justify the confidence reposed in him by being neutral and imperial, only to turn and show his interest,”. Speaking in Yola, the Director Publicity of Ribadu’s Campaign organization Umar Calculate said, ‘’It’s on that note that I call on all the aspirants to make it known that all we need is a level playing ground and equal opportunity,’’ he said. However, in a reaction, the chairman of Fintiri’s campaign Organisation, and former Deputy Senate Leader, Jonathan Zwingina, said that Mr. Fintiri has the constitutional right to contest the bye-election. Mr. Zwingina said “People are making mistake by saying Fintiri does not have constitutional and moral rights to contest for the bye election. The acting governor does not only have right to be in office for 90 days before a bye-election is conducted but equally have right to complete the remnant tenure of the ousted Governor Murtala Nyako”. Mr. Zwingina told journalists that their principal does not believe in being anointed by President Goodluck Jonathan, nor anyone but by God who is the one that enthroned and can dethrone at will and at his own time. “Our principal is the aspirant to beat in the next PDP primary. His efforts in rehabilitating the deplorable infrastructures are eloquent testimonies of the performance of the Acting Governor, Ahmadu Fintiri,” he said.